There are three shirts available, as pictured below. All shirts are available in mens and ladies styles. All shirts will have the 2017 Roundup Logo (logo colour will differ depending on shirt colour). embroidered on the front left. The cost per Yarra shirt is $30, and $25 for the Biz Crew. Shirts must be pre-ordered. We will not have stock of these items available for sale at the event, but will place an order post-event if needed. The only other merchandise that we are taking orders for at the moment are grille badges, details of which can be found here. We also plan to have some other merchandise such as drink coolers, coffee mugs etc available for purchase at the event. Yarra Polo in Black with red trim (click on image to enlarge). Available sizes are mens XS-3XL & 5XL and ladies 8/10 - 24/26. 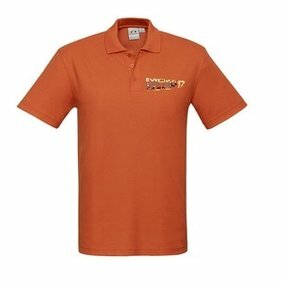 Biz Crew Polo in Orange (click on image to enlarge). Available sizes are mens S-3XL & 5XL and ladies 8-24. Biz Crew Polo in Charcoal (click on image to enlarge). Available sizes are mens S-3XL & 5XL and ladies 8-24. Please order via the online order form or by email, and you will be invoiced for your order and Roundup registration fee. Any orders submitted after 5pm on 25 February may not be ready in time for the Roundup.